Get to Know the Broker that Will Get You to Where You Want to Go. My Expertise is Turnaround Sales and Marketing / The turning of slow-sale real estate, usually an expired listing, into fast-sale real estate. You can get anything you want in real estate if you realize it is gained by (1) Bold attention-getting marketing that draws buyers to property like metal shavings to a powerful magnet (2) High-level negotiation and (3) Transaction-making skills of a long successful knowhow broker. Real Estate Prof's World Enterprise Marketing / Our programs and strategies both local and outreach personalized to (1) Your house (2) The local market and (3) The International community, stretch and break the boundaries of the mass-solution to real estate sales practiced by conventional area-bound agents, companies and franchise giants. Leadership, a structured program and personal involvement will distinguish our service. I - in Affiliation - with a high-profile partner where your property is located put the unique features of my program - The Game Changers - into action to stimulate the market and induce offers beginning the day a visit is arranged to share our program. The Game Changers / Elite, Top of The Mark, Sales and Marketing Strategies without equal in the marketplace developed over five-decades doing this one thing. Foremost among the strategies shared in-house are (1) The Secret of Success (2) Branding (3) The Money Door (4) Advertising (5) World Outreach Net/Work Marketing (6) Sale by Auction Marketing and something I just call (7) Reach (a wide-ranging expertise sought by Top of The Mark Builders to sell their Luxury Home Projects wherever located). Sometimes in Real Estate Close is Not Good Enough / When market conditions are such that selling is not a challenge because of the economic climate or because of supply-and-demand relative to some “Hot” region or locale, high-level professional marketing is not something people think a lot about: half-measures are adequate to the job. On the other hand, when the wheel turns and you find “Unexpectedly” that selling is a challenge, a weak line of action will not suffice. To do better you have to get better. "It's my intention to get you more money for your house than anyone believes possible in today's market and, possibly, more money than anyone has ever gotten before for a house like yours in your entire area or neighborhood; and it's my intention to do it quickly: to list, sell and close within ninety-days irrespective of your experience to date or what you may personally think or feel about the market. "To do that I have to do some 'Extraordinary Things' and a few ordinary things, but in an extraordinary way. "The 'Pillars of Success' of any great marketing effort are strategic planning, intentioned activity and records to substantiate effort and progress. My agendas for doing these things are (1) The Seller Services Portfolio / A twelve-step structured marketing program evolved out of more than forty-years' experience striving to perfect a fast-sale marketing strategy for getting properties sold in a timely fashion at the top of the market whether the market is up or down and (2) The Fast Sale Marketing Worksheet / An individualized (a) Marketing Program (b) To Do List and (c) Activity Register customized to meet the selling needs or situations specific to your property and locale. "Each is a supernova of sales activity made up of bold and enterprising programs that move through the market like juggernauts (unstoppable forces that crush whatever are in their path) always focused on doing first things first and on keeping the main thing, the main thing. "The 'Main Thing' of course is getting your count up, meaning your body count: targeted buyers that preview your property per the Secret of Success, Item #2 of the Seller Services Portfolio. Knowing exactly who your buyer will likely be (a buyer predisposed to region, area and locale) and what to expect per The 49-to-1 Rule (that you can expect to receive at least one offer than can be negotiated to success out of every fifty buyers that preview your property) is paramount to success. "All programs, big or small, must follow these and other foundation principles to ensure success. You have to know where you're going to get there." Big Programs for Big Thinkers. Because of your career path or profession or business I'd say it's probable you are a marketing professional yourself; because of that, I think you'll appreciate the "Game Changers" we at my company, Real Estate Professionals World Enterprise Marketing, bring to the table. Among them are World Outreach Marketing and Sale by Auction Marketing. World Outreach Marketing / World Outreach Marketing, the unique way we practice it, is a full-participation network marketing program designed to skyrocket the potential for a fast-sale of most any Custom Home, Estate or Resort-Oriented Residence by reaching out to what I dearly call Rich Overseas Buyers and Locals with Means with a program exclusive to our company, Radiant-Outreach Net/Work Marketing, a pathway for (1) Leads (2) Referrals and (3) Direct Sales among hundreds-to-thousands of brokers and agents with already-established business relationships inside sub-markets not accessible by any one standalone real estate company or agent. The outreach is global, of course, but also local among professionals tuned-in, tapped-in and turned-on as they say inside the entertainment, sports, business, finance and legal industries, and others. It is a marketing program par excellence that extends reach exponentially by means of unique-to-the-industry collaborative marketing agreements and over-the-top incentives that skyrocket the potential for fast sales among long-on-the-market unsold properties previously listed with other agents -- that's what it's for -- and distinctively an unequivocal self-generated MLS for marketing Top of The Mark properties owned by sellers that seek to sell outside-of or independent-of mainstream Realtor-oriented methodologies; the only of its kind. I emphasize Net/Work because effective network marketing is a hands-on activity requiring hard work week-in and week-out to be effective; we are organized for doing that to the benefit of all and report to you - in Writing - all goings-on every week. Sale by Auction Marketing / I'm proud to share here bits and pieces of my program for selling real estate by auction. Known as The Fast Sale Auction, it is program endorsed by top people in the industry and successfully used throughout the state to sell hundreds of properties in all price ranges: mostly long-on-the-market unsold properties that each needed an attention-getting promotional boost to get sold and the sellers to where they wanted to go. The savings and loan crisis of the 1980s and 1990s (commonly dubbed the S&L crisis) was the failure of 1,043 out of the 3,234 savings and loan associations in the United States from 1986 to 1995. Financing literally dried up. This created some very special sales and marketing challenges in real estate, especially for the luxury home market, because there were just too many homes for sale among the few buyers that could take action on buying. The key to success, then, I figured, was to draw the few to a single standalone house among-the-many by some creative means to provide for its seller a stream of buyers that wouldn't otherwise bother to see it. I decided to do this by means of an attention-getting "Auction" of most every property I and my associates listed at that time, but not by a one-day all or nothing effort typical of auctions tried in real estate by auction companies both then and now, but by a unique day-in, day-out sale by sealed bid program unique to real estate that I wrote and created to sell our listings "1st" among all others in the local market. The upshot of all this is that during that time frame the largest-name companies in real estate were selling 20% to 30% of their listings during a normal listing period while at the same time, I and my associates were selling 70% to 80% of ours. We have sold hundreds of homes with it since for both home owners and builders alike. Using it, we draw both buyers and agents to a property like metal shavings to a powerful magnet in greater numbers than any other program on the market. It’s not uncommon for a home owner to put a home on the market by auction with us that has been for sale for six months, a year or even longer, and then to sell it within six-to-eight weeks. We give sellers an edge on competition in the market by making their home the first one a buyer will look at if they want to buy in their area: the value-buy message inherent to selling by auction demands that. We sometimes use it for the reverse purpose: to sell for more money than the asking price. The Game Changers / In conclusion, may I emphasize that neither of our Game Changer programs shared here (1) Radiant-Outreach Net/Work Marketing nor our (2) Sale by Auction program are colloquial franchise-like rubber-stamp marketing programs centered on posting properties on MLS (the Multiple Listing Service) and social networks like Zillow, Trulia, Facebook, Google, YouTube, MSN, Yahoo and the like, though I do that too, they are the real thing. With these programs and others, I have sold homes and lots now reaching into the thousands that often were unsold expired listings of other agents prior to my taking over the sales and marketing effort. I look forward to sharing these and what I call the Secrets, Substances and Privities when we meet. Expect the best. Real Estate is a tough business compounded by economic downturns that come like clockwork disturbing the peace and well being of all. Success for most during these times is found on the far side of failure. Sometimes the trial by fire (the learning curve) is short, sometimes it is long. When long, delayed rewards often end a promising career early sidetracking the wishes and dreams of many: both agents and their clientele alike. This is why turnover in real estate is nearly 80% every two years among both agents and companies; and why, often, the old standards (long existing companies) go weak and franchise seeking help from without. I have put all this behind and survived the tumult over and over again prospering my clients during both the best and worst of times by means of a boundary-breaking career underscored by a unique advantage I had over all: that of representing the building-trade for the sale of hundreds of new-development projects as both an advertising-professional and sales-broker five-decades running. The advantage? Well, most things boil down to money, don't they! Hired and paid to succeed during even the worst of times I was able to use millions-of-dollars of other peoples' money, banks, that is, in trial-and-error marketing formulating unique approaches to both sales and marketing that stimulated activity on my projects when others had none at all. It was here that I developed an expertise and reputation unique to my experience for "Turnaround" sales and marketing underscored by programs for turning slow-sale real estate into fast-sale real estate. Accordingly, I have left trial-and-error far behind and formulated a surefire path to success made up of proprietary (1) Strategies, tactics and actions (2) Art, images and literature (3) Structure, contracts and agreements (4) Online protocols and websites for making our overall program and of course "World Outreach Marketing" a reality in my and my clients' experience that others, virtually everyone else in real estate, have yet to realize. Plain Talk / The franchise giants like (Keller Williams, Sotheby's, Coldwell Banker), (First Team, Berkshire Hathaway, Engle & Volkers), (Re/Max, ERA, Windermere), Century 21 or any other you can name all put forth a one-company facade and a presumption of having an International platform or array of programs for reaching out to overseas buyers when, in actuality, they are standalone, independent offices owned by local brokers that spend all their time recruiting agents, training newcomers, and juggling the books to keep their doors open. You Won't Find a CIA Among Them / A Central Intelligence Agency coordinating the marketing of individually listed properties. This is why when you list with a franchise company, whatever their image or position in the market, that after only one or two months, sometimes only one or two weeks, little to nothing is done to further the aim of selling your property except continued listing on MLS and recommended price reductions. I have a number of proprietary programs for solving this problem and for reaching out to buyers both locally and Internationally that grows exponentially month-to-month that I would like to share with you along with a new "Top of The Mark" appraisal of the value of your property in hand when we visit. Within just a few weeks of starting, your house will be the main attraction in the local market; it will be a serious contender for "First Preview" by incoming buyers from many overseas markets seeking to buy property in your area; and we, together, will reel in big-fish-in-a-small-pond agents, some you already know, for cooperative marketing many times the efficacy of MLS. Power marketing is a hands-on activity of mining for gold day-in and day-out subject to an orderly schedule of activities (a strategy) for getting you to where you want to go. A classic mistake sellers make is to list with a franchise giant solely because they believe power-in-the-market is derived from the namesake or size of the franchise-organization they list with when the reverse is actually true: power in the market is derived from the execution of blueprint strategies for getting to where you want to go carried out by a single hands-on marketing professional that - Champions - the sale effort of some standalone House, Estate or Resort-Oriented Residence until success is achieved by one means or another of a multilevel marketing plan executed with vigor. The BUCK STOPS Here / I/we seek to be that Champion for you. See how this is planned for and done by looking over our Multilevel Marketing Plan and Fast-Sale Marketing Worksheet customized to the unique potential for World Outreach Marketing specific to your property. Call any time to arrange a time for doing this. for Both Home Owner and Builder Alike. There's a Great Difference... between putting a home on the market and marketing a home. If that were not true, then builders with projects valued at tens-of-millions of dollars would list their projects with local area agents and let MLS work its magic; but they don’t, because listing with a local area achiever, a franchise operator, and MLS for a builder is the kiss of death. Builders have to work with a marketing professional that knows how to create demand by creating markets; that knows how to stimulate incentive and how to merchandise onsite, offsite, online, in print and through personalities to achieve success. That expertise is what I bring to the table for both home owner and builder wherever needed; thus my motto: Non-local, Unbounded, My Influence Extends Everywhere. To Make the Point / You might breakaway for a moment, here, to visit one other of my information-oriented websites, Builder Sales and Marketing , to look over a collection of projects I've sold out for builders all across the California southland and within other states selected from among hundreds of success stories. 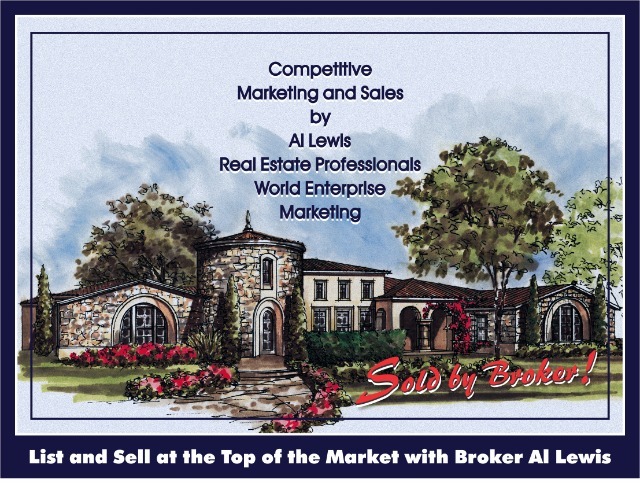 I've dominated the southern California sale and marketing of new homes for independent builders five-decades running providing three essential services: Advertising, Merchandising, and Sales; often selling the highest-priced multi-million dollar tract housing in the state. When a project goes dead-in-the-water, kind of like an expired listing, my phone rings, there’s a builder on the other side and I'm invited to prepare and present these things to their partners, investors and banks (1) A Proprietary Strategic Marketing Plan, and derived from that (2) A Fast-Sale Marketing Worksheet and Budget, all designed to effect a turnaround sales experience: from slow to fast. The Crossover is This / The whole of my career, the whole time I have worked with builders, I also have been in the resale market focused on the high-end and do the same thing for home owners that I do for them (1) I Prepare a Proprietary Strategic Marketing Plan, and derived from that (2) A Personalized Fast-Sale Marketing Worksheet that, when executed, gets us all to where we want to go. Victory Outreach / You are cordially invited to peruse a few among hundreds of listing and sale success stories I call "Victory Outreach" posted on the sidebar to the left. I call them "Victory Outreach" because the examples stretch the southland from Coronado to Calabasas, the Coast to the Mountains and the Desert; the whole of southern California. Once put to work within any locale or neighborhood, interstate or otherwise, I and a high-profile local Marketing Partner become the dominant local agents as though always there by means of a structured marketing plan executed with vigor and make your house the main neighborhood attraction within a few weeks' time. The standout qualitative difference between my companies, Real Estate Professionals World Enterprise/Allstate Marketing, and an area-bound local agent's wherever located is that we are a non-local, unbounded, professional marketing company, more like an advertising agency than a real estate company, and like an advertising agency with branches the world over that brands and represents products to buyers the world over, we also brand our clients' homes for success in both the local and International markets, but our unique way (1) With Such a Strong Image of Success that Their Power of Attraction is Irresistible (2) Underscored by Attention-Getting Marketing that Stimulates Interest and (3) Action-Oriented Incentives that Drive Sales. Our programs and strategies both local and outreach - Personalized to Your House and the Local Market - stretch and break the boundaries of the mass solution to real estate sales practiced by conventional area-bound agents, companies and franchise giants. We do not wildcat or beat around the bush trying new ideas but provide leadership, a structured program, and proprietary sales and marketing tools needed to implement and effect an "Initial Sales Success" or a "Turnaround Sales Experience." How to Do Business with Me. That's the Easy Part / Call any time to talk with me or to an initial contact Marketing Partner associated with my company that may have called on you to represent our program. That's it. We'll plan a visit and go from there. Confidential presentation and personalized sales strategy with new appraisal provided in-house.